We’ve made it to the last contest of the first round, and this one is a doozy. Yesterday we saw Savings rate take down Mortgage. Today we have a true Kentucky versus Duke-style clash; this is a match of the real bluebloods of the investing world. As always, check out the disclaimer. 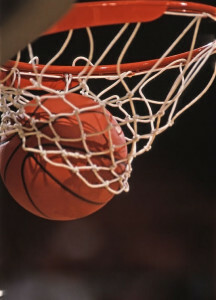 Let’s go to the game. Starting early is one of the sage pieces of wisdom everyone gives, and for good reason. The earlier you start investing, the more time you give the incredible power of compounding. In this way, Starting early is very similar to Savings rate which we saw won the last game. Because of the compounding the numbers seem to act “funny” (not funny “ha ha,” but funny as in not a way you would expect unless you are an expert in exponential algebra). So let’s say Mr Grizzly just got his engineering degree at age 22 and wants to retire with $1 million on his 60th birthday. Similar to the previous examples his starting salary is $50,000 and it gradually increases to $100,000, and he can get a 6% return on his investments. If he starts saving at age 22, he will need to save about 9% of his salary to get to the $1 million mark by 60. However, let’s say he can’t start right away, and instead he starts saving at age 30; now to become a millionaire by age 60 he needs to save about 13% of his income. Wow!!! By delaying a measly 8 years early on, he has to increase his savings rate about half again what it was. If he puts it off until he’s 40, he needs to save 25%–that’s doubled his savings rate compared to starting at 30!!! And if he delays starting until he’s 50, it will require he save about 67% to become a millionaire by the time he’s 60. Clearly the earlier you start, the easier it is. 9% of your income isn’t trivial, but it certainly seems manageable. On the other end of the spectrum, it seems just plain unrealistic to be able to save 67% of your income; even 25% would be a tall order for most. So everyone can agree it’s better to start earlier rather than later. Done deal. But the problem with these types of analyses is saving more comes at a cost. That $4500 you saved at age 22 (9% of your $50,000 starting salary) meant you couldn’t spend that. Perhaps that’s not so bad if you were wasting it on clubbing and mani-pedis, but who am I to judge? But maybe clubbing and mani-pedis are what makes life worth living. Broadening that out, nearly all of us are making less early in our careers, so how realistic is it for us to be saving right away? Also, early on you actually have higher expenses like repaying student debt, buying furniture for your new place, buying a work wardrobe, and just kind of experiencing life. That’s not to say that people can’t be disciplined about those things, but there’s got to be a balance. I personally started saving about 30% when I first started working and I think maybe I should have traveled a little bit more and enjoyed that time of my life (I was living right outside of New York City after all). Nonetheless, Saving early is a tremendously powerful force if you can afford to do it. There’s no doubt in my mind that the Fox family is at a comfortable place right now in large part due to the fact that I started squirreling money away so early. Taxes are a tremendously important part of investing. 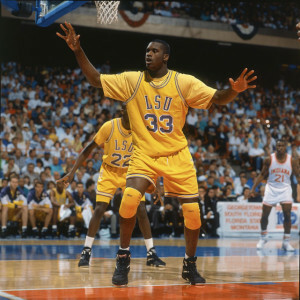 It is a dominant force like Shaquille O’Neal on those LSU teams from the early 1990s. Taxes impact every facet of investing—whether you’re young or old, no matter the type of account you have (401k, IRA, brokerage, Mortgage). Obviously taxes take a chunk out of nearly every financial transaction you do. What makes Tax optimization so important is that during your earning years, that chunk can be in the 30-50% range, obviously depending on a number of factors like your income and the state you live in. However, in retirement when you’re income is lower, that tax rate might fall to 10% or even less (of course, as my good friends Rich and Mike pointed out, no one knows what future tax rates will be—I am just assuming that tax brackets remain the same as they are today). Many of the Tax optimization strategies to some degree involve finding ways to not pay taxes at the higher rate when you’re working, but rather pay when you’re retired and your rate is lower. 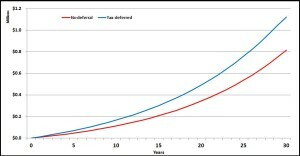 Just how big of a deal can taxes be? Let’s look back at that example from The tax man cometh. Mr and Mrs Grizzly are ready to save $1000 per month, either in a taxable account like a brokerage account or a tax deferred account like a 401k. Using a regular brokerage account after 30 years (let’s assume a 2% dividend and a 5% stock increase) they have about $815k—certainly nothing to sneeze at. However, had they invested the exact same amounts in the exact same stocks but instead in a tax deferred account, they would have had $1.12 million. That’s almost $300k more, just for Tax optimization!!! The only difference is when they paid taxes on the money and at what rate. In a taxable account they were paying taxes on the $12,000 each year at their high-income tax rate (34%) and they were paying taxes on qualified dividends (thanks Rich) at a pretty high rate too. 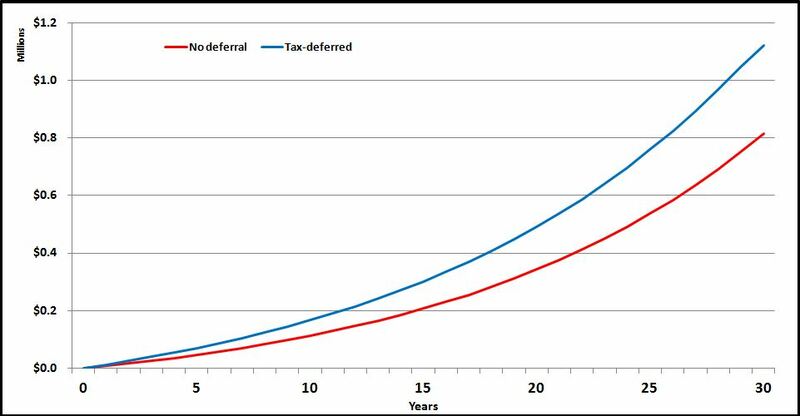 In the tax deferred scenario, they were paying taxes on the money after they were retired which I estimated at about 2% because at that time their income is only what they are spending. That’s just one example, and there are tons just like that where Tax Optimization can really add up to tons of money. There’s no such thing as a free lunch, but this gets pretty darn close. When you put your money in a tax deferred account, it gets more difficult to access if you need it right away, but that seems a pretty small price to pay compared to the massive benefits of tax deferral. This clash of the titans was super close. In the end I have Tax optimization winning on a Christian Laettner-esque (sorry to all my Kentucky friends) miracle shot to push it to the Final Four. 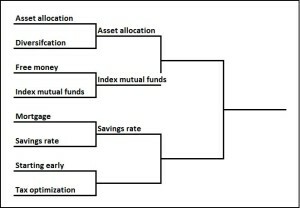 To me I think this comes down between something that is not very complex but involved sacrifice (Starting early) and something that is fairly complex to pull off but doesn’t involve a lot of sacrifice (Tax optimization). Ultimately, when Starting early you’re taking money that could have been spent on something else and started investing it. So long as you weren’t planning on setting the money on fire, that will involve a sacrifice. Conversely if you do Tax optimization you really aren’t foregoing anything, except a little bit of liquidity. All it is is being smart with taxes and setting up the right accounts. 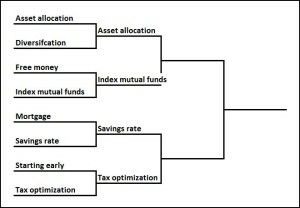 There are a lot of pretty easy Tax optimization maneuvers like 401k, IRAs, etc., that only take a few hours to figure out and then you’re set for decades. So you’re getting those huge benefits without a lot of effort. But Starting early is requiring a fairly significant sacrifice in your early years that could cause quite a sting. Put all that together and I have Tax optimization coming out on top 83-82. I have to confess though, I think Starting early would have beaten a few of these other strategies if it had lucked out a little bit in the draw. Well, that was a wild first round. 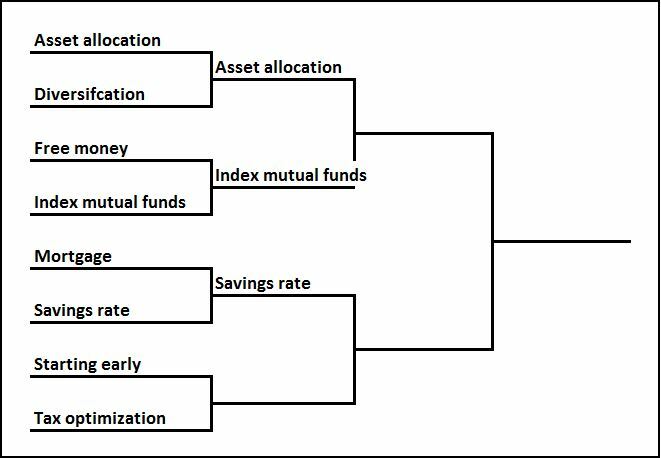 I hope you enjoyed this and we’ll see you tomorrow for the first match of the Final Four, Asset allocation versus Index mutual funds.